freestompboxes.org • View topic - Wiring help needed.. I was wondering if anyone might be able to help me design the wiring for my custom build solid body electric. I'm pretty good at soldering etc, but when it comes to designing the electrics, some assistance would be very helpful indeed. It may be that someone could point me towards an existing guitar with similar electrics, but anyway.. here are the requirements I have in my mind.. The guitar is to have two pickups, a humbucker in the bridge (available with either two or four wires.. whichever is more appropriate), a Strat type single coil in the neck.. there will be four controls plus a pickup selector, comprising of a master volume, a tone control for each pickup, a blender pot to fade from one pickup to the other whilst both pickups are selected, and a three way Switchcraft toggle selector. The selector will be simply wired for 'neck' in position one, 'neck & bridge' in position two, and 'bridge' in three.. the pots will likely be CTS. The guitar will have a Tele style jack plug, and a fixed bridge which will also need earthing. I was also planning on adding a treble bleed to the circuit if possible. Well I think that pretty much sums up what I have in my head as far as the wiring goes.. I'd be extremely grateful of any assistance, either to help me figure out the wiring from scratch, or to point me towards an existing guitar with similar electrics.. either would be very much appreciated. Hey Russ, welcome to the forum. You're going to need an additional 3PDT toggle as well to switch between either the pickup blend-pot or the traditional pickup selector switch. Let's take image below as the base for what you want to accomplish. Looking pretty good already. 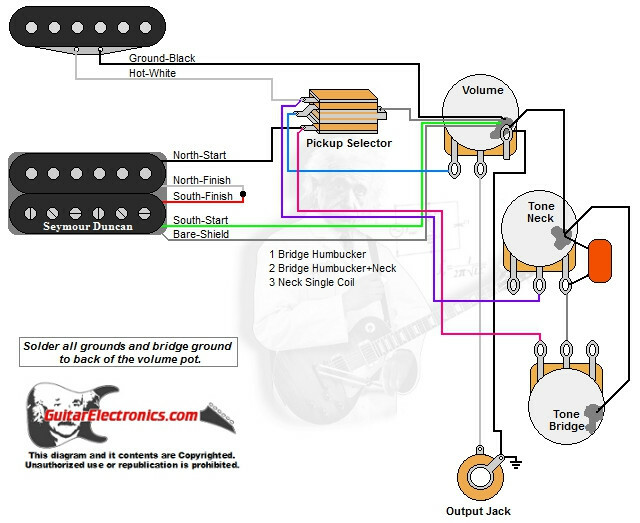 Now, let's take out the pickup selector switch and replase it with the image below. So the white wire from the neck pickup and purple from the neck tone in the first image go to the position of the grey wire for neck hot on the 3PDT toggle of the second image. Black from the neck pickup and violet from the neck tone go to position of the yellow wire and Bob's your uncle. Seems like a bit of a hassle to operate to me, but I'm certain you thought this through and know what you want.